We are pleased to announce that Grosvenor Place Management is set to commence The Stella Project which entails the conservation works of the Frank Stella’s “Cones and Pillars” artworks in the lobby of Grosvenor Place. 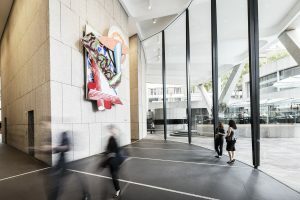 These important artworks were commissioned by Harry Seidler and the triptych was installed in the building in 1987. 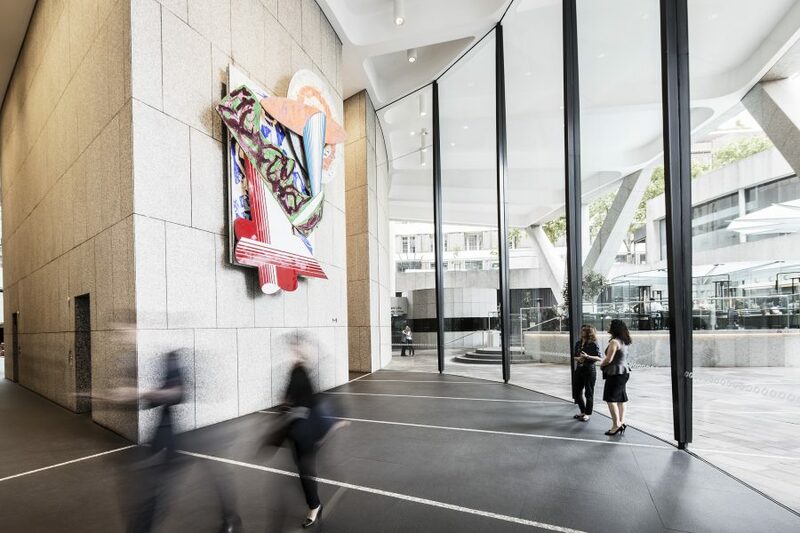 Honouring and conserving the work of the pre-eminent modernist artist, Frank Stella is an important project which will preserve these valuable artworks which take pride of place in our lobby. Due to the logistics of size and access, the works will be taking place on site within the Grosvenor Place lobby. All the work will be undertaken from mobile scaffolds units to carry out the treatments in situ. All conservation materials that will be used are non-toxic and any paint and dust that is dislodged during treatment will be captured during the treatment process. Noise during business hours will be minimal with no use of noisy equipment. The construction and deconstruction of the scaffold will be undertaken on the weekends. Works will commence July 8. Works will progress in three stages where it is estimated that three weeks will be dedicated to each painting. The duration of the entire conservation works will be approximately 10 weeks. You can follow the journey of the conservation works under the care of David Stein and his team from David Stein & Co by visiting our story board which will be located in the lobby over this period.